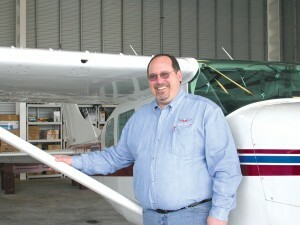 Dale Terwedo discovered both flying and Angel Flight West while in his forties. He’s flown 16 mercy flights to help people get needed medical attention. Dale Terwedo loves helping people. He also loves flying. He’s discovered that Angel Flight missions give him more reasons for flying and a chance to help people, too—especially children. “I just like making a difference in people’s lives, whether it’s helping them plan their financial future or helping them get long-distance medical care when they can’t afford air transportation or can’t travel on commercial airlines,” said the founder of Edmonds, Wash.-based Terwedo Financial Services. Angel Flight is a nonprofit organization formed “to ensure that no financially-needy patient is denied access to distant specialized medical evaluation, diagnosis, treatment, or rehabilitation for lack of a means of long-distance medical air transportation.” Terwedo often makes these vital flights in his Cessna P206, a personalized model with two front doors and a utility door not found on the standard 206, with space to fly five passengers. “It’s really fun when kids are old enough to sit in the right seat and try their hand at flying. Then I trim the plane up nice and tell them I need to take a nap,” he said, grinning. But Terwedo knows there’s a serious side to these flights, too. His passengers, both children and adults, are often too sick or weak to enjoy trying their hand at flying or joking around with their pilot. He’s one of the 1,600 pilots in Angel Flight West who fly more than 2,750 free, charitable mercy flights annually in 13 western states, including 345 flights in Washington last year. A year ago, he flew from Paine Field Airport, in Everett, Wash., to Spokane, to pick up Addie Tom, an 11-year-old girl from Montana who needed to fly to Seattle for her kidney transplant preparation at Children’s Hospital. In February, he was reunited with Addie on a similar flight from Spokane to Seattle for a follow-up medical check on her new kidney. “Recently he flew critically-ill 7-year-old Kailee Wells and her father, Owen, from Seattle to Vancouver, B.C., for treatment for aplastic anemia, a rare and often fatal disease that demanded a successful search for a bone marrow donor. Being adopted, she had no family marrow matches, but Vancouver’s large population of Asians and Pacific Islanders offered her more opportunities to find an acceptable donor. In February, Kailee received her transplant and continues to recover in the hospital. Another Angel Flight passenger, Tanya Kennedy, 36, of Lake Stevens, Wash., was picked up at Red Bluff Municipal Airport in California and returned to Paine Field with her three children, Josh, Josie and Joey, after treatment at Loma Linda University for her brain tumor. Using his flying skills to help people in need is an extension of his other interests, and his personality. Rarely sitting still and easily bored, Terwedo likes to keep busy. His adventurous streak and need to help people also inspired him to help people when he bought a Hummer. Young Addie Tom, 12, of Stevensville, Mont., has flown three times with Dale Terwedo. After years of fighting renal failure, she recently received a kidney transplant from her mother, Gayle (far right), but still needs follow-up visits to Children’s. Impressed with the practical use of modern gadgets, he even has a wristwatch with an emergency beacon, in case his plane ever goes down. His wife, Tara, sometimes joins him on flights. “She has a good eye for things that will make kids feel more comfortable, such as finger-nail painting for Addie on her flight from Spokane,” he said. Like most things he takes on, Terwedo went full bore into flying when he began lessons in April 2001, on his 42nd birthday. 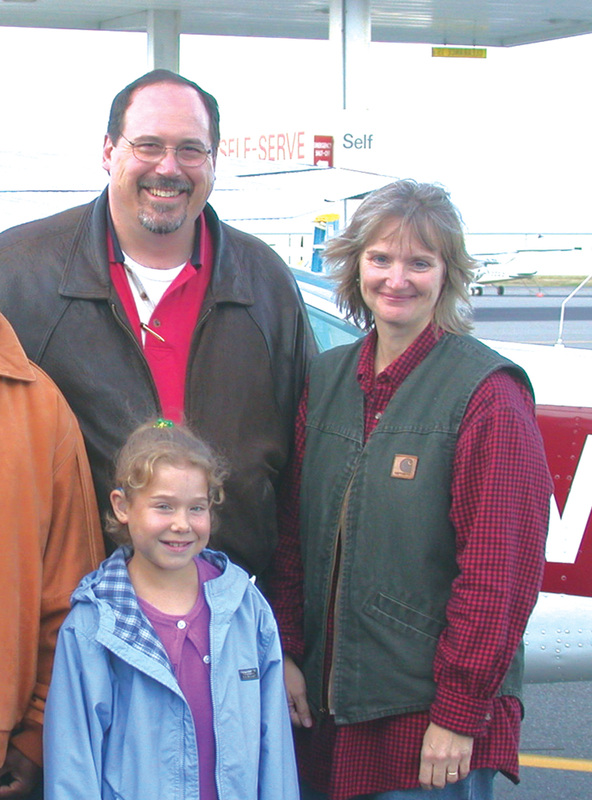 “Since joining Angel Flight West in July 2003, Terwedo has flown 16 missions, including more than 10 in 2004, earning him an award from Angel Flight West, along with six other Washington pilots who also flew more than 10 mercy flights last year. It’s the feeling of “giving back” and being able to use his flying skills and financial stability to help others that fires up Terwedo, who donates his time, aircraft and fuel to help people in need. He noted that while he makes Angel Flights, his staff is able to maintain his business. “Our clients are very understanding about my being gone. In fact, they’re really supportive. 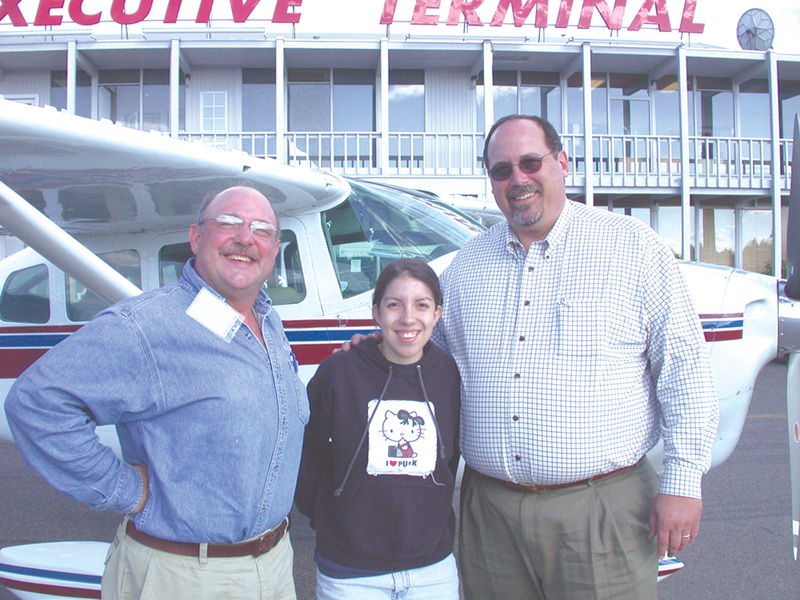 We’ve even gotten some new clients because they admire my role in Angel Flight,” said Terwedo. 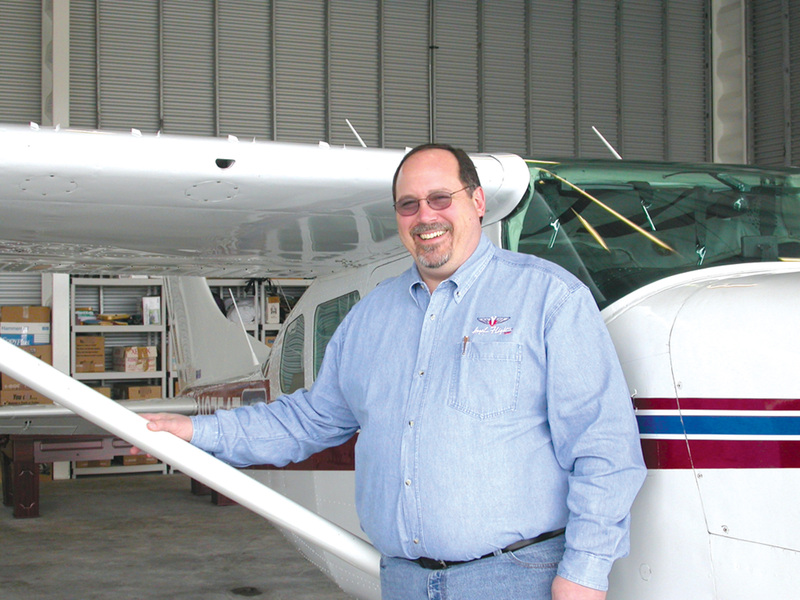 Angel Flight gives pilots “a reason—or an excuse—to fly,” said Fred Jossy, a Seattle RE/MAX realtor who is the Washington wing leader for Angel Flight West. Jossy, who flies a Mooney on his Angel Flight missions, also spends a lot of time attracting more members, offering displays and presentations at such events as the annual Northwest Aviation Conference in Puyallup, Wash.
Angel Flight West, a grassroots organization based in Santa Monica, Calif., is geographically the largest of six autonomous nonprofit Angel Flight America groups in the central, south central, northeast, mid-Atlantic and southeast sections of the nation. Mercy Medical Airlift operates as a seventh AFA nonprofit member to arrange long-distance commercial flights. 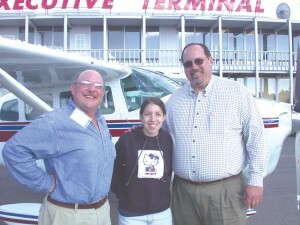 For more information on Angel Flight in Washington, visit [http://www.angelflight.org/washington] or contact Fred Jossy at (425) 488-0203. Dale Terwedo, Terweda Financial Services LLC ([http://www.tfsadvisors.com]), can be reached at (425) 776-0446.